It's common knowledge that most people are advised to get their home on the real estate market in late spring or early summer as that is 'real estate season.' While the majority of homes do sell in the spring and summer, listing your home or looking for a home during the holidays or in the winter is not as taboo as some would lead you to believe. There are actual benefits to listing or looking for a home during the holidays, and if you've missed out on the real estate scramble of the spring and summer, starting a home search or listing your home now might just be in your best interest. Here are some of the top reasons why you shouldn't avoid listing your home, or looking for a home, during the holidays. Many would lead you to believe that the real estate market comes to a complete stand still during the holidays or in the winter, but that's not the case. Every state's real estate market is thriving year-round, and that even includes during the holiday season. Serious buyers never stop looking, and a serious seller (or a seller that wants or needs to sell their property) will keep their home or property on the market all year long. The holidays bring out the buyers and sellers that are determined -- they need something or want to sell now, and they're not willing to wait for the spring or summer. Many people with school-age children want to wait to buy a new home when their kids are not in school, but the reality is that a family or anyone looking for a new home can move at any time of the year. Perhaps if you're in an area with inclement winter weather, you might want to put off your search or move until better weather arrives, but for those that live in a mild climate, moving in November or December is just as easy as moving in May or June. Buyers can also sign up for new listing emails, which alert them to whenever a new property has come on the market, and sellers have the ability to sign up for sellers reports, so they can stay on top of the market in their neighborhood. While it is known that home inventory is largest during the spring and summer months, the MLS always has homes and properties listed on it. 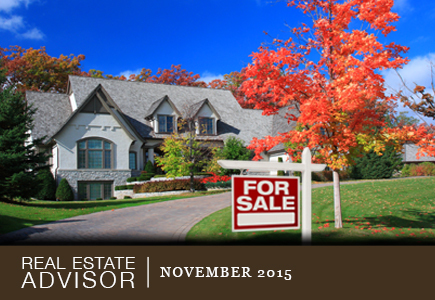 Fall and winter will have properties available, but the number of properties will be lower. Unless you're totally transfixed on a certain home, or you have a list of needs and wants a mile long, you can be sure to find a property that will fit your housing needs throughout the year. Despite the fact that inventory will be lower in the fall and winter, people still list their homes, especially if they are serious sellers. While the market is slower, it also is less competitive in terms of other buyers looking for homes. It's likely the fall and winter won't create scenarios of multiple, high dollar offers on one property; buyers and sellers alike will have more opportunities to actually think about offers, and especially for buyers, low competition guarantees that you're not making a rushed or rash decision based on emotions or other offers when you do find the perfect property. This is specifically for buyers, but it's widely known that home prices slightly fall in the fall and winter when the market has cooled down and more serious sellers are keen to get a sale. This is mostly because real estate sales are seasonal. But that's not to say if you list your home in the fall or winter you're going to have to drastically slash the price in order for your property to sell. While it might sit on the market a little longer than it would in the spring or summer, fall and winter sales happen, and if you're a serious buyer or seller, you know you'll want to do all you can to make your dream of buying or selling a home a reality. You'll see a lot of articles on how to spruce up a home to ready it for the real estate market, and while the tips are definitely valuable, it's not a secret that many people decorate their homes over the holidays. There's something warm and inviting about a decorated home, or a home that feels cozy, and people who list their homes in the fall and winter can take advantage of a fireplace or wood stove to make a room more inviting. If your property doesn't have a fireplace or wood stove, you can use candles and other things to make the home smell inviting to buyers. While it may seem cumbersome to sell a property during the holidays or in the winter, you do have some ways to play up the season. And if you are truly set on avoiding the holidays, you can always put it on the market the first of January, when the chaos of the holidays is over.